Since we’re all friends here, I have a bit of a confession to make: I am a banana bread-aholic. It has come to the point where I often buy bananas with the hope that no one in the house will eat them. I place them carefully behind the knife block or next to more appealing brightly colored citrus fruits as a sort of consumption deterrent. Then, I watch them patiently as they slowly turn from green to yellow to brown to a delicious shade of black. It’s easy to convince myself that banana bread is a healthy treat, because it’s full of bananas. Much like the vegetable argument behind carrot cake, filling any baked good with a large quantity of fruit is psychologically the baking equivalent of eating a side salad with your bacon cheeseburger. The problem with this type of thinking is that it completely ignores all of the other ingredients, particularly the butter and white sugar. With the “D” word hanging over my head, I feared that I would be in for a long banana breadless journey. My friend and fellow bakeaholic Cristina suggested to me that I check out a website called The Skinny Chef, where it was rumored there existed a less guilty recipe for peanut butter banana bread. I went on the site, and suddenly it was as if the clouds parted and my computer glowed with a magical light. That is how much I love love love banana bread. All that was left to do was wait for some bananas to ripen up, and I would be on my way to dessert heaven. 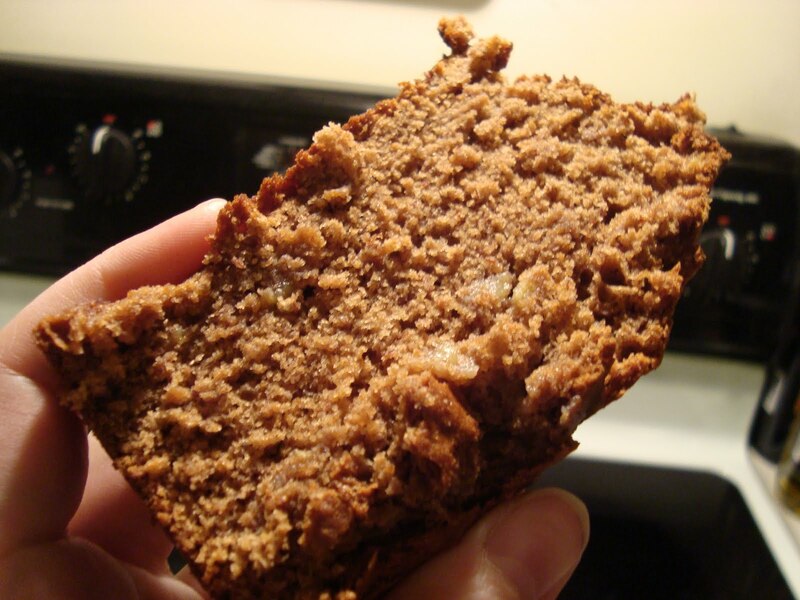 This banana bread is a dieter’s dream come true. It uses whole wheat flour, egg whites, brown sugar, and the peanut butter takes the place of butter or margarine. Plus, the added bonus is that the protein in the peanut butter makes each slice wonderfully filling. I followed the recipe fairly closely, except for two very delicious substitutions. Since I didn’t have quite enough peanut butter for the recipe’s requirements, I added about 3 Tb of Nutella (always a favorite in my baking endeavors) and since the recipe didn’t specify I used fat free banana yogurt. The result was the most delicious banana bread I have ever made in my entire life. Considering how much banana bread I’ve baked over the years, that’s saying quite a lot. For the recipe, check out the Skinny Chef website here. I would also suggest you stop by Cristina’s blog, 100 Days of Happy, for a regular dose of amusement. AMAZING! So glad you liked the recipe. Your cake looks absolutely delicious. I'm always wary of futzing with recipes, but it sounds like your adventurousness payed off. I'll have to try your Nutella trick. I almost always make this with crunchy peanut butter, and will usually sprinkle some walnut pieces along the top. Also, thanks for all the love. I look forward to the visits of your devoted fans. Xoxo. I love a good kitchen adventure (although admittedly this time it was simply out of need). I figured that since the PB replaces the oil, adding a touch of Nutella to top of the 2/3 cup would probably serve the same purpose (since it's basically hazelnut butter with a touch of cocoa). It gave it a nice color and just a slight hint of a cocoa taste. Crunchy peanut butter sounds fantastic though! I'm thinking about experimenting with cashew butter next time. I also thought about adding pecans, but I wanted to keep the calories in check. Ok, I'll stop now, because I could seriously talk about this bread forever. I LOVE using yogurt in cake/bread recipes . . . it keeps everything so moist! I use it in apple cake, another fruit filled delight! Does your bread taste peanut buttery? Or is it still more banana bready? 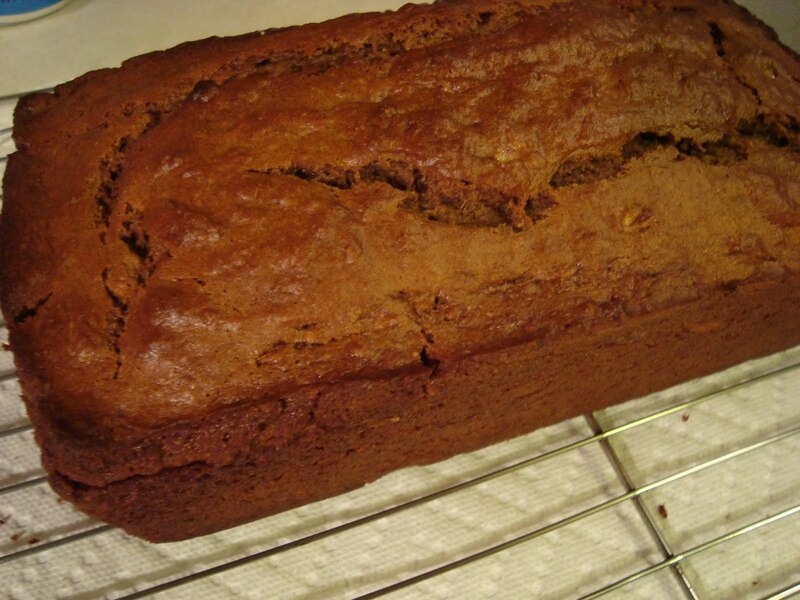 It has a general banana bread taste with a peanut butter undertone. My version tastes slightly of cocoa from the Nutella (but not very much). I highly highly recommend it!